Disability in India is complex, dynamic, multidimensional, and contested. According to the 2011 census, a staggering 26 million people are affected by disabilities in India. This is not only the largest group of its kind in the world now, but continued population growth will ensure that India remains the home of the largest number of people affected by disabilities on the face of the planet. Years later, in a recent report: World Bank states that there are between 40 and 80 million people affected by disability in India. Where proVISION ASIA resides, in the state of Karnataka, the 2011 Census reported that 13.24 lakh are affected by disability; however, Ex. State Commissioner for the disabled Mr. KS Rajanna believes that there are at least 30 lakh people who have some form of disability. There are several factors affecting disability in India, they include premature births, complications after births, consanguineous marriages, accidents, diabetes, illiteracy and lack of awareness. Disability and poverty go hand-in-hand, lack of care for the mother leads to medical complications during pregnancy leading to the birth of children with disabilities in many cases. Lack of health insurance and government provided support leaves, disabled people, behind. riving this cruel cycle is often an underlying religious belief that people affected by disabilities are cursed, or are a curse; and that “bad karma” is responsible for their plight. Acquired disability, is caused by accidents, wars and natural disasters. Lakhs of people acquired disabilities through road accidents. In the year 2016, there were over four lakh people who acquired disabilities in India. Although laws have been written to assist people with disabilities, too often there is little attempt to communicate their rights and societal benefits. Free train and bus pass; monthly food rations; medical services and even housing are available; yet, they are unaware that these benefits exist. The 2016 RPD ACT that was passed will enable people with disabilities to have equal opportunities was replaced by the earlier UN Persons with Disabilities Act, 1995. The major highlight of the ACT is that people with disabilities will become decision makers in administration and guardianship. Government job opportunities are set to increase from 3-4% for this sector. However special education is not defined in the new law. People with disabilities in India presently suffer discrimination on social and economic terms. The ACT is a landmark in moving in the right direction to create a holistic environment and enhancing the quality of life. It is imperative that this ACT is enforced in every state and the governing body be diligent in the implementation. Despite all advances, many people believe that persons with disabilities are a burden and are incapable of having relationships. This belief is rooted in the historical perception of people with disabilities as objects of charity. For instance, asking the caretaker of a wheelchair user if the person on the wheelchair needs assistance while the person who can best answer the question is right next to the caretaker. For all our unity in diversity claims, disability in India has still not been accepted as part of human diversity. The answer to why this persists perhaps lies in the fact that persons with disabilities have remained at the fringe of public discourse and are therefore starved of these much-needed conversations. If only our society would take a step back and look at the bigger picture, it would be surprised to understand that people with disabilities; like all eight billion of us, are wired to love and to be nurtured. The desire to belong and be loved as a person is the source of their emotional development. Friendships enable us to be vulnerable while we enter-in to the life of a person with disability in India. Here is where inclusion begins. Our country needs to take heed and choose the right narrative to portray people with disabilities in India. 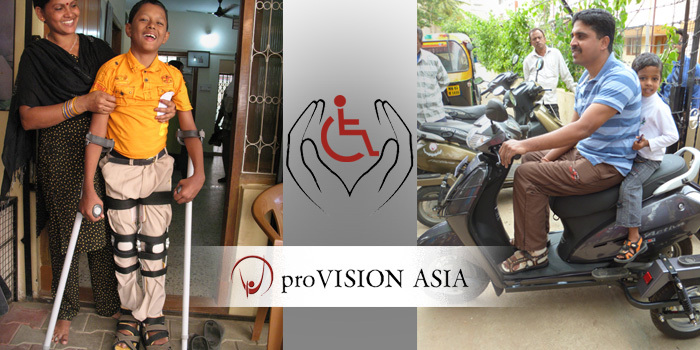 proVISION ASIA is here to inspire hope among people with disabilities in India by providing an environment which fosters transformation. We encourage the vision of abundant life through practical life-skills training; provision of mobility aids, physiotherapy, job placements, education sponsorship, computer training; counseling and government advocacy.